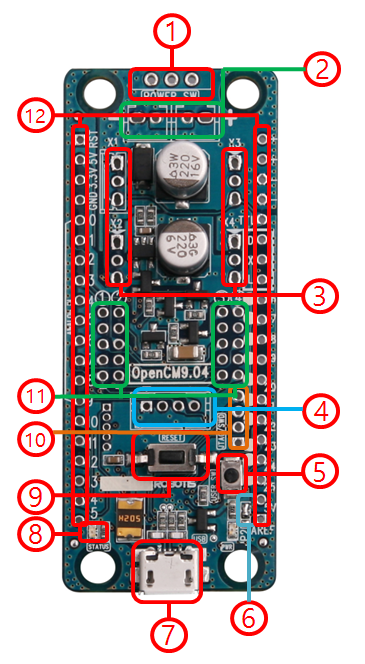 Please DISCONNECT OpenCM9.04 and OpenCM 485 Expansion board when updating or recovering Dynamixel firmware. Series Battery Socket : Connects two LBS-04 Lithium-ion battery. Dynamixel TTL 3 PIN : Port for daisy chaining Dynamixels that use 3-pin cables (Dynamixel TTL Bus). 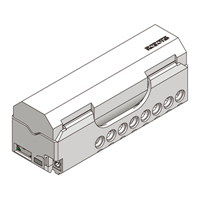 Communication Port : Used from wired/wireless communication using peripheral devices (i.e. BT-210, BT-110A, ZIG-110A, LN-101, etc). 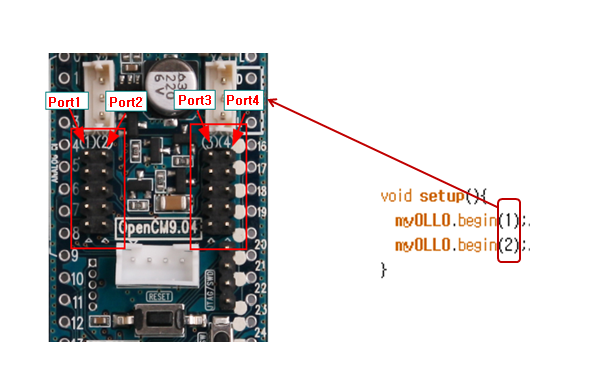 OpenCM9.04’s 4-pin communication port uses Serial2(USART2). User Button : a button that can be controlled/programmed by the user. Can be used as pin 23 or BOARD_BUTTON_PIN. It can be initialized in setup() as pinMode(23, INPUT_PULLDOWN). 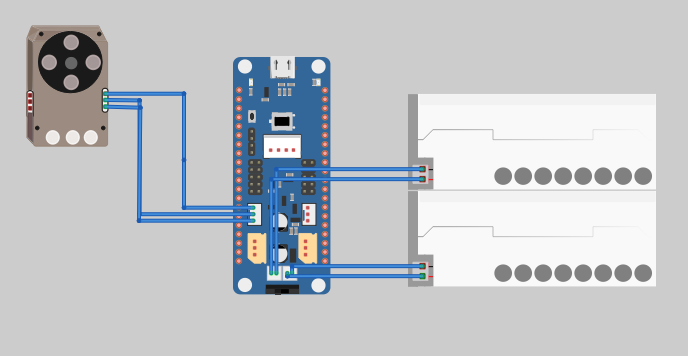 Micro-B USB : Used to download programs onto OpenCM9.04 and used to communicate with other devices via USB while simultaneously supplying 5V to the board. Status LED : LED used to test OpenCM9.04’s program. 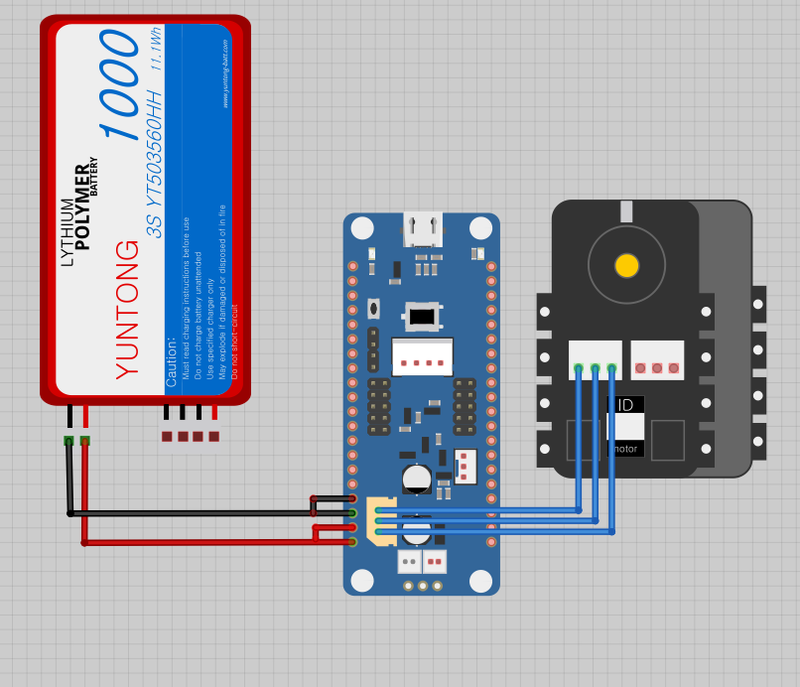 The LED turns ON when Pin 14 or BOARD_LED_PIN is HIGH and turns OFF when it’s LOW. PWM control is possible. Reset Button : imitates the CPU to reset. 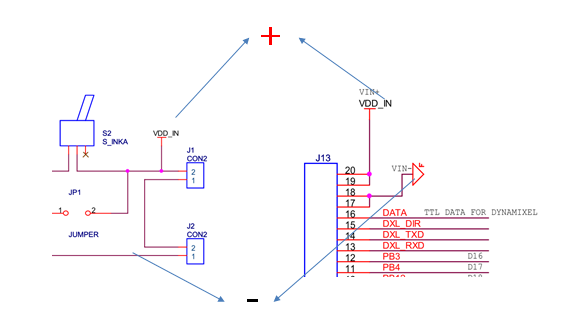 JTAG/SWD 4 PIN : Used to connect ST-LINK or other In-Circuit Debugger/Programmer. 5-pin Port : used to connect ROBOTIS 5-pin devices (modules). 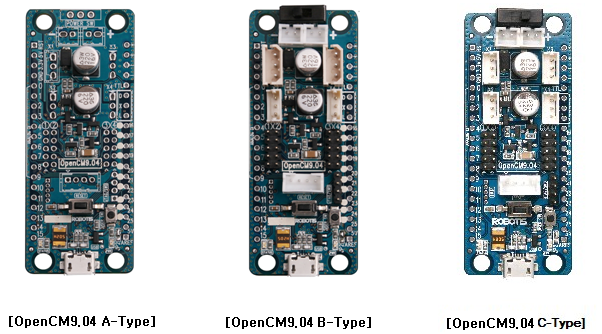 I/O Header : OpenCM9.04’s CPU <STM32F103CB> can be accessed via GPIO pins. 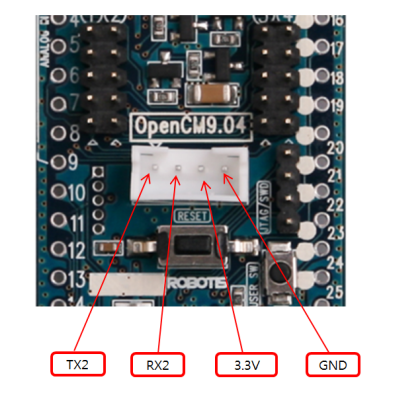 All of OpenCM9.04’s GPIO pins can internally “pull-up” or “pull-down” and can be modified via software. “Pull-up” and “pull-up” resistance is 40Kohm(Typical). • RST : Pin connect to the CPU Reset signal. 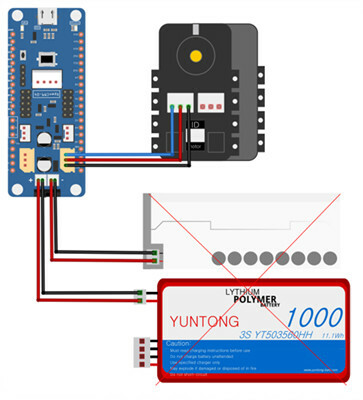 • 3.3V : outputs 3.3V when the power is supplied to the board via battery or USB cable. • GND : GROUND(-) terminal. • A0 : Digital I/O and analog input. • A1 : Digital I/O and analog input. 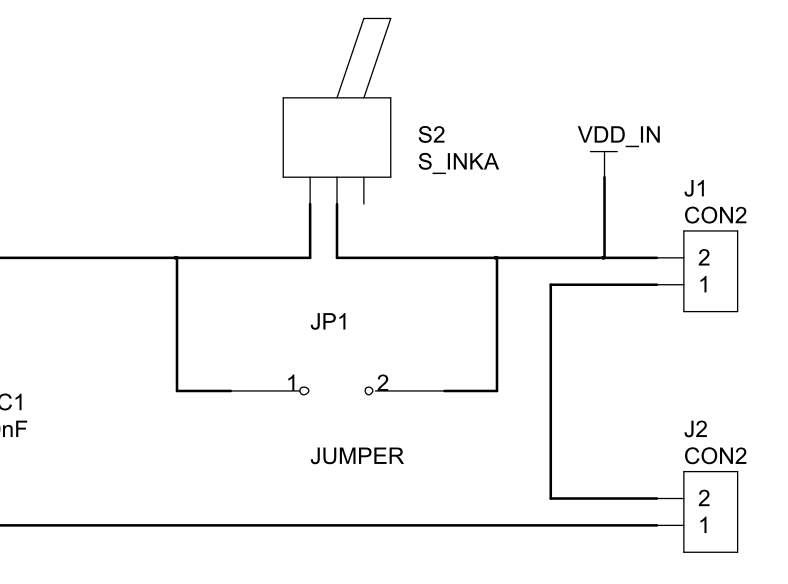 Can be used for SPI channel 1’s SCK clock-pin. • A2 : Digital I/O, analog input, & PWM output. • A3 : Digital I/O, analog input, & PWM output. • A4 : Digital I/O, analog input, & PWM output. Used as USART1 (Serial2) channel’s TXD pin and connected to 4-pin communication port’s TX2. • A5 : Digital I/O, analog input, & PWM output. Used as USART2(Serial2) channel’s RXD pin and connected to 4-pin communication RX2. • A6 : Digital I/O, analog input, & PWM output. Can be used as SPI channel 1’s MISO pin. • A7 : Digital I/O, analog input, & PWM output. Can be used as SPI channel 1’s MISO pin. • A8 : Digital I/O, analog input, & PWM output. • A9 Digital I/O, analog input, & PWM output. • D10 : Digital I/O & PWM output. • D11 : Digital I/O & PWM output. USART1’s (Serial1) TX pin. Cannot be simultaneously used with the Dynamixel TTL Bus. • D12 : Digital I/O & PWM output. USART1(Serial1)’s RX pin. Cannot be simultaneously used with the Dynamixel TTL Bus. • D13 : Digital I/O & PWM output. • D14 : Digital I/O & PWM output. 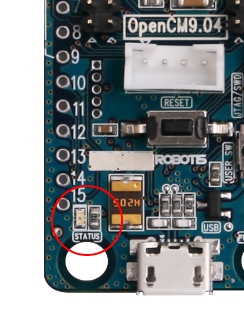 Pin connected to the Status LED. 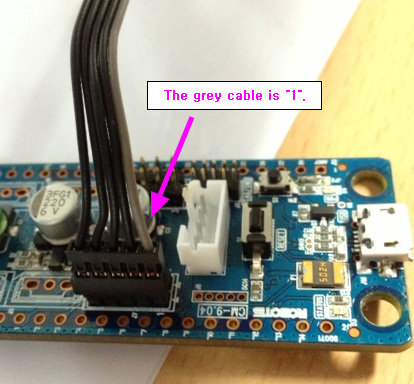 It’s pre-defined as BOARD_LED_PIN. • D15 : Digital I/O. • VCC(+) : +voltage of the board. There are 2 VCC(+) pins. Connected to the + terminal of the battery socket. • GND(-):-voltage of the board. There are 2 GND(-) pins. Connected to the + terminal of the battery socket. • TTL : Dynamixel TTL Bus’s Data line. Used to communicate with 3-pin TTL Dynamixels. • D : Relevant to Dynamixel TTL Bus and used to select TX, RX. • X : Dynamixel TTL Bus’s TX pin. • L : Dynamixel TTL Bus’s RX pin. • D16 : Digital I/O Pin. • D17 : Digital I/O Pin. • D18 : Digital I/O Pin. • D19 : Digital I/O Pin. Can be used for SPI channel 2’s SCK clock pin. • D20 : Digital I/O Pin. Can be used for SPI channel 2’s MOSI pin. • D21 : Digital I/O Pin. Can be used for SPI channel 2’s MOSI pin. • D22 : Digital I/O Pin. Maximum output current is 3mA and maximum toggle speed is 2Mhz. the board initiates Emergency Recovery (Download) Mode. Maximum output current is 3mA and maximum toggle speed is 2Mhz. • D24 : Digital I/O Pin. 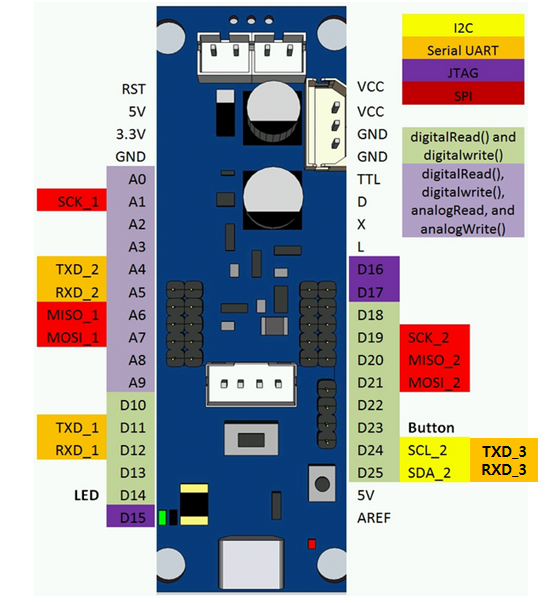 Can be used as I2C channel 2’s SCL pin or USART3(Serial3)’s TX pin. • D25 : Digital I/O Pin. 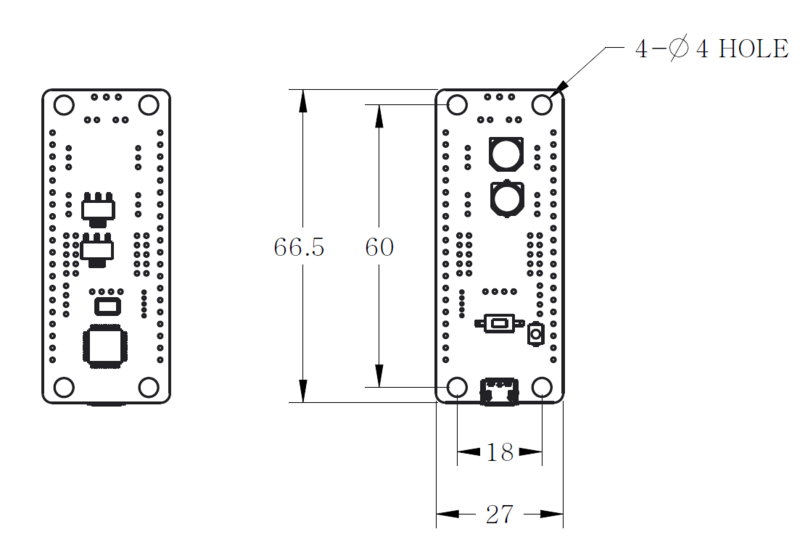 Can be used as I2C channel 2’s SDA pin or USART3(Serial3)’s RX pin. • 5V : 5V output pin. 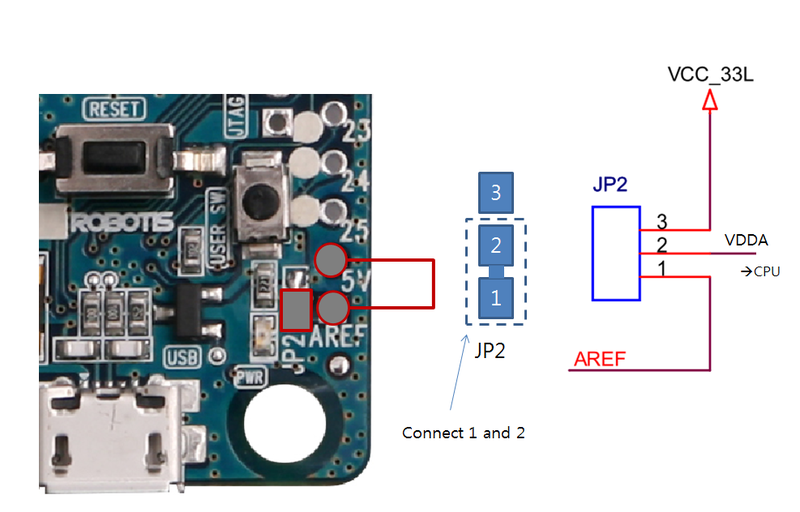 JP2 jumper can be modified to connect to AREF pin and change the default voltage to 5V. 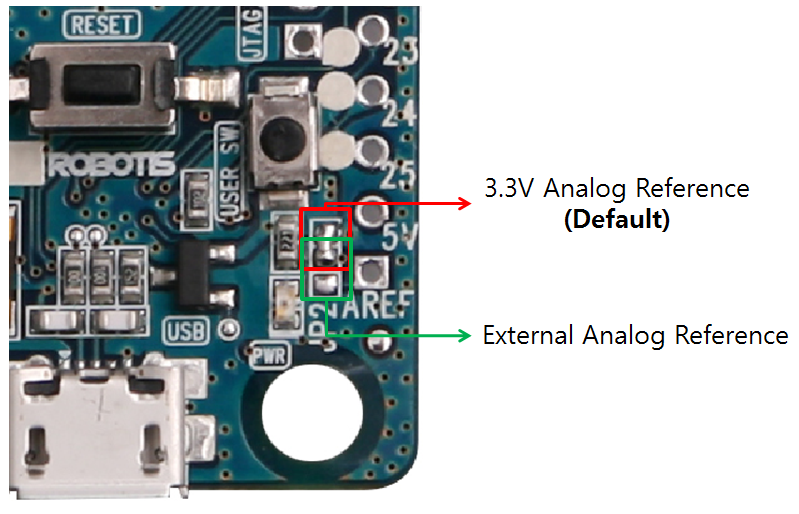 CAUTION : Check the pin supporting up to 5V once Analog Reference (AREF) has been modified to 5V. incorrect battery to the battery socket. Only connect LBS-40 onto the battery socket. 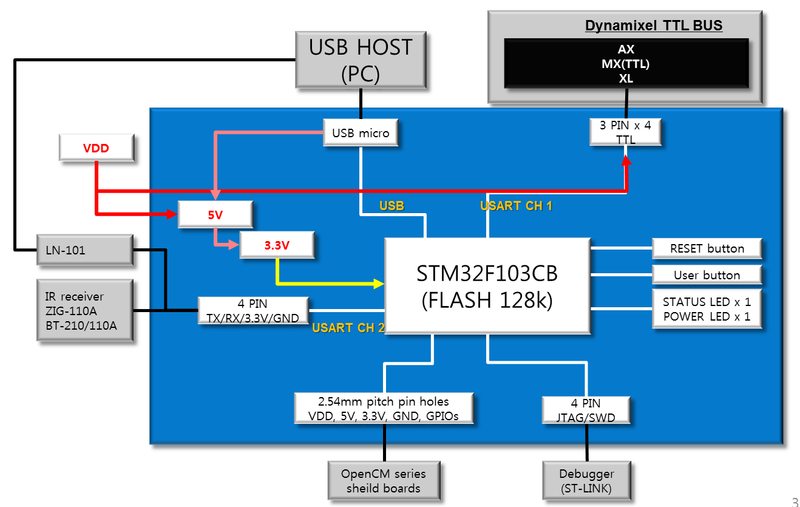 -USB power is cannot be used to operate Dynamixels. Separate power supply needs to be provided. 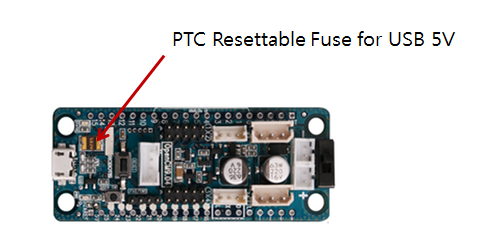 -Check the operating voltage for peripheral devices when using additional power supplies. Dynamixel or XL-series is receives the exact voltage supplied. -Dynamixel and XL-series cannot be used together due to different operating voltages. 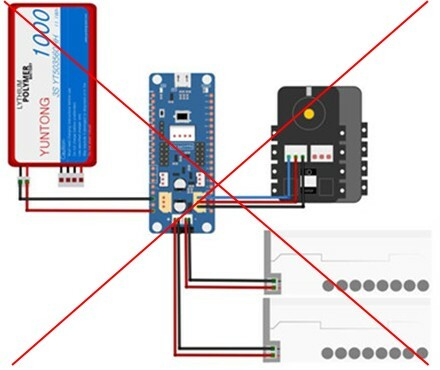 The Control Table is a structure of data implemented in the controller. 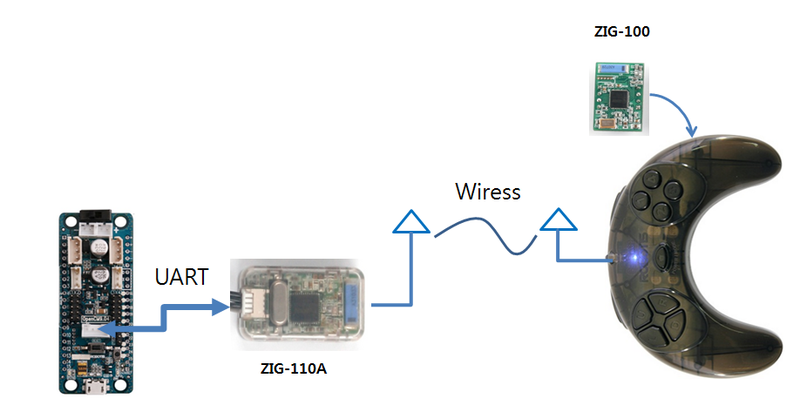 Users can read a value from a specific address to monitor the status of controller or write a value to an address to control the controller and connected devices to the controller. 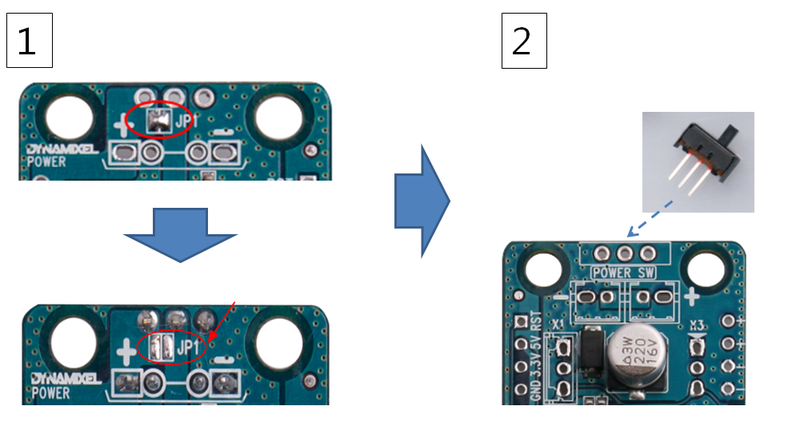 The Control Table is divided into 2 Areas. Data in the RAM Area is reset to initial values when the controller is turned on (Volatile). On the other hand, modified values in the EEPROM Area are kept even when the controller is turned off (Non-Volatile). The Control Table has two different access properties. ‘RW’ property stands for read and write access permission while ‘R’ stands for read only access permission. Data with the read only property cannot be changed by the WRITE Instruction. Read only property(‘R’) is generally used for measuring and monitoring purpose, and read write property(‘RW’) is used for controlling devices. Each data in the Control Table is restored to initial values when the controller is turned on. Default values in the EEPROM area are initial values of the controller (factory default settings). If any values in the EEPROM area are modified by a user, modified values will be restored as initial values when the controller is turned on. Initial Values in the RAM area are restored when the controller is turned on.